The San Fernando Valley Branch of the Sogetsu School of Ikebana and The Japanese Garden in Van Nuys will present sculptural creations of floral and plant materials on Sunday, Sept. 9, from 10 a.m. to 4 p.m. (last gate admission at 3:15 p.m.). Live demonstrations of ikebana arrangements will be presented by Kyoko Kassarjian and other ikebana teachers at 11 a.m. and 1 p.m. in the garden’s Shoin Building. Kassarjian, director of the Sogetsu San Fernando Valley Branch, is an internationally recognized ikebana artist who has been granted the highest degree, riji, by the Sogetsu School in Tokyo. She currently teaches ikebana classes at UCLA Extension and Pierce Community College. 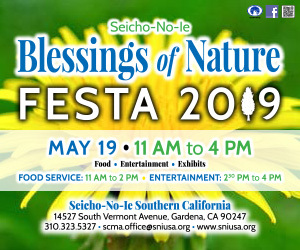 The garden was created by Dr. Koichi Kawana, who pioneered the design of traditional Japanese gardens that utilize plants native to the area of the garden, and is located at 6100 Woodley Ave. in Van Nuys. General admission for this event is $5; children under 10 are admitted free.